Commercial Sales Specialists drive direct sales of the company’s product and services by bringing in potential customers. 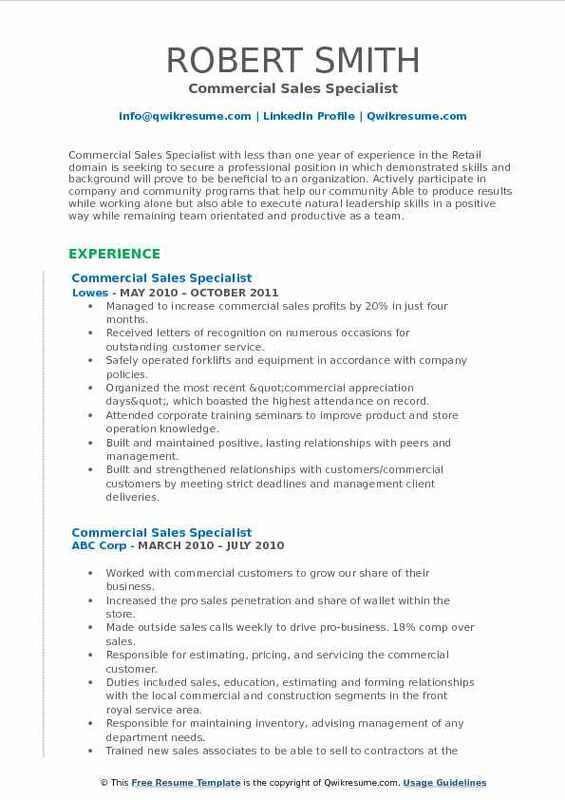 The commercial sales Specialist is tasked with various other responsibilities such as taking the lead and resolving customer issues, ensuring customer satisfaction, assisting customers with specialized merchandise, coordinating and leading the sales associates. 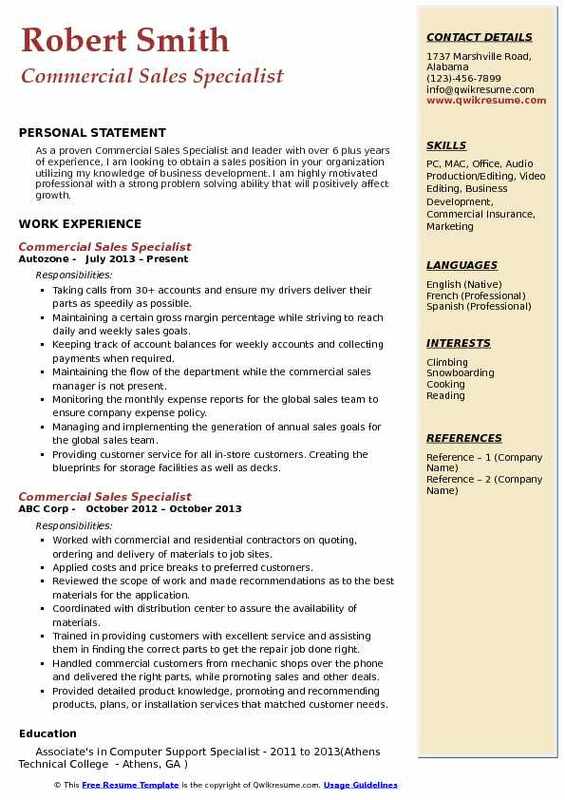 Ability to handle multiple customers, strong servicing skills, determination to reach targets, excellence in communication, impeccable accountability and commitment are some of the attributes that a hiring employer seeks for in a Commercial Sales Specialist Resume Sample. 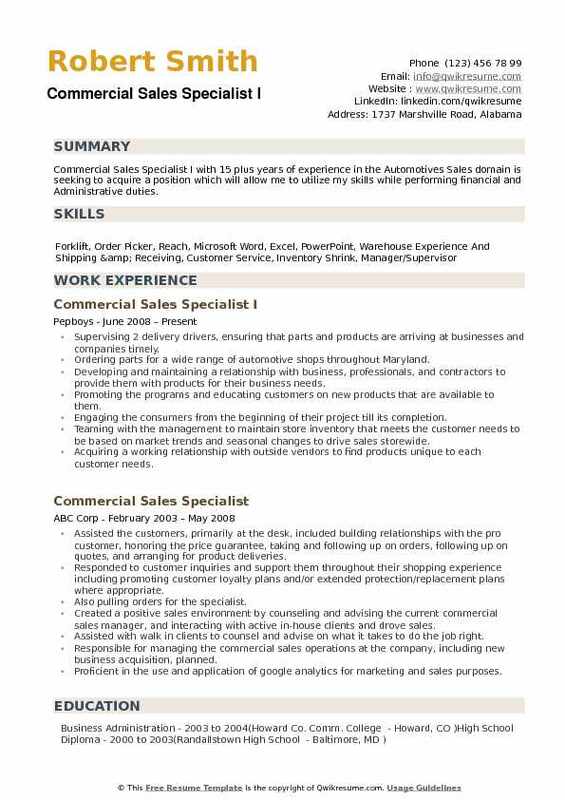 Possessing a High School Diploma with few years of experience in direct sales is the minimum requirement for this job post. However, some employers do prefer a Bachelor’s degree in marketing or business or its related field. 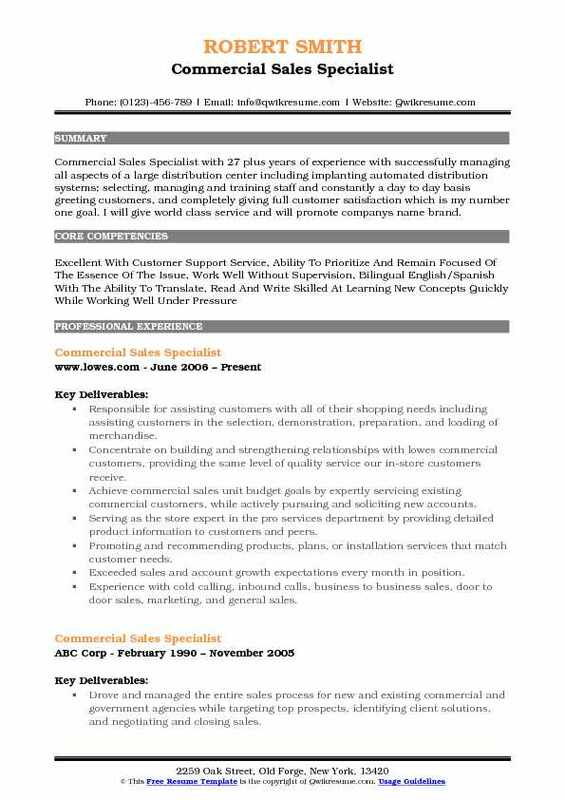 Summary : Successful Senior Commercial Sales Specialist with 8 years of experience in service, and leadership while maintaining proper business etiquette. I am focused on meeting deadlines, exceeding expectations, and making sure to deliver the best possible outcome in every situation. Skills : Strong Verbal Communication, Time Management, Conflict Resolution, Attention To Policy And Procedure, Team Leadership, Punctual, Self-motivated, Customer Focused. Responsible for maintaining a professional business setting with local contractors, business owners, and regular customers while seeking out and obtaining new business partners. Fulfilled the needs of contractors by going above and beyond to ensure that every order was placed. Took on customer concerns and or complaints by assessing the problem, and using the tools. Necessary to de-escalate the situation by giving excellent customer service according to the company. Ensured a safe work environment not only for fellow employees but to our loyal customers as well. Met and exceeded appointed goals of positive business growth, steady margin, and boosting sales. Remained in professional contact with current business partners to ensure that all of their needs are met. Opened over 200 new accounts a year to help grow the business for the store as a whole. Stayed up to date on the latest material and products for the contractor to use on their projects. 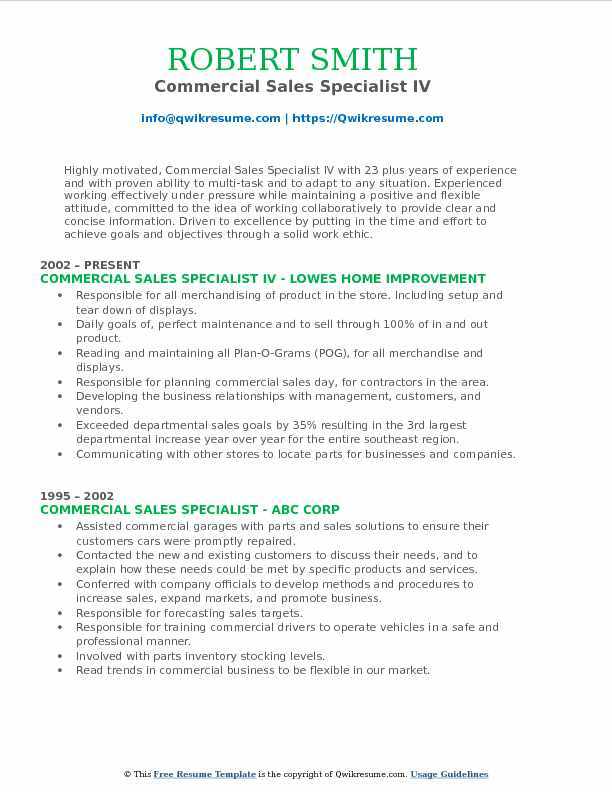 Summary : Sr. Commercial Sales Specialist with 8 years of experience is seeking a position as a sales representative where I can influence specifications by leveraging my relationships, skills, and experience, resulting in profitable sales for the company I represent. Developed strategic relationships with the architecture and design community to obtain specifications on commercial projects for the immediate and future business. Tracked the projects throughout the U.S with the sales team to close deals and secure orders. Responsible for aia continuing education seminars and pursuing new account opportunities through cold calls, lead generation and independent knowledge of competition to obtain market share. Developed relationships with IHG and Hilton to attend owners conferences and have Florida tile approved as a vendor for their properties. Maintained a service-oriented sales approach, while meeting or exceeding the customer's expectations. Received top sales award throughout the U.S in first two years for sales in excess of 6 million. Daily calls to priority client accounts for promotions, current work orders, and special needs. Summary : Commercial Sales Specialist I with 11 years of experience in the Retail domain is seeking to obtain a full position that enables me to combine my strong educational background in electronics and allow me to thrive in a fast-paced environment revolved around technology. Understood and interpreted blueprints to assist with project quotes. Interoffice promotion to shipping and receiving in the deliveries department. Understood the various supplier paperwork formats and verified the shipping contents against the paperwork that was enclosed. Worked closely with customers to train and educate them on how to operate their product(s). Performed various levels of problem-solving during customer delivery and install. Always reliable and flexible to come in and work to meet business goals. On a daily basis, responsible for planning the days work among the team for routing deliveries. Consistently regarded among peers to have excellent routing knowledge and methods. Served as the point person to several new vendors that brought new large accounts to lowes. 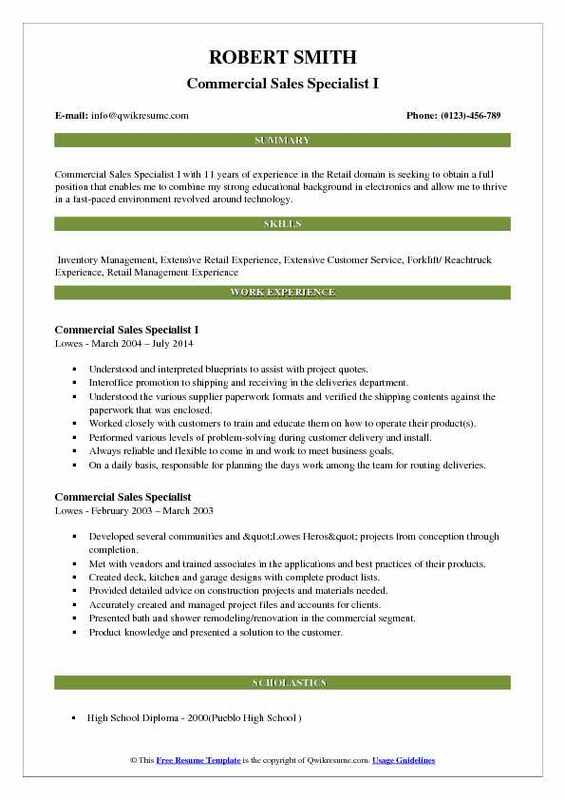 Objective : Commercial Sales Specialist with less than one year of experience in the Retail domain is seeking to secure a professional position in which demonstrated skills and background will prove to be beneficial to an organization. Actively participate in company and community programs that help our community Able to produce results while working alone but also able to execute natural leadership skills in a positive way while remaining team orientated and productive as a team. Managed to increase commercial sales profits by 20% in just four months. Received letters of recognition on numerous occasions for outstanding customer service. Safely operated forklifts and equipment in accordance with company policies. Organized the most recent "commercial appreciation days", which boasted the highest attendance on record. Attended corporate training seminars to improve product and store operation knowledge. Built and maintained positive, lasting relationships with peers and management. Built and strengthened relationships with customers/commercial customers by meeting strict deadlines and management client deliveries. Exceeded the commercial sales unit budget goals by expertly servicing while actively pursuing and soliciting new accounts while managing multiple vendor relationships. 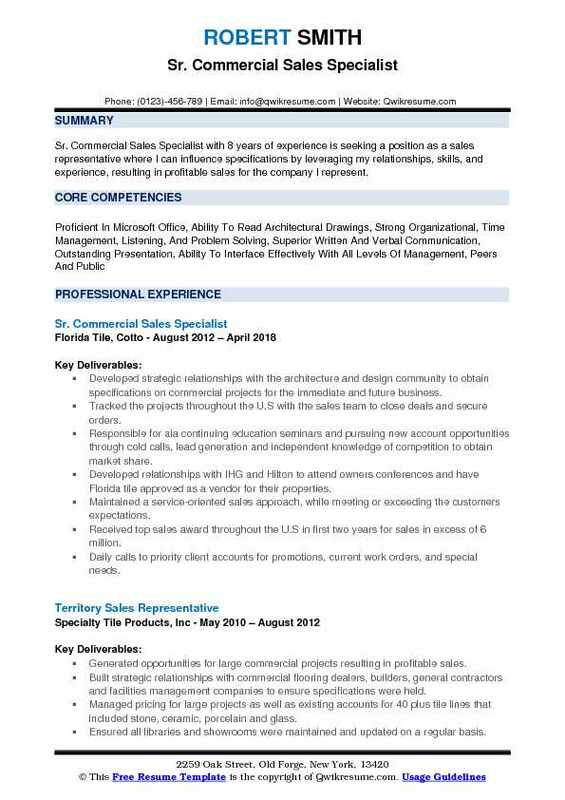 Summary : Commercial Sales Specialist II with 14 plus years of experience who's objective is to obtain a position where my strong customer service background, computer skills, sales experience, and creativity will greatly benefit the company. Responsible for maintaining personal and departmental sales budgets, extended protection plan sales, add-on sales, installed sales, and special order sales. Building the relationships with current commercial customers to increase sales. Managing the accounts and providing flawless customer follow up manage inventory effectively to reduce margin loss. Following the competitors to be able to stand above the competition and close the sale. Responsible for managing, training, and motivating cabinet and appliance associates. Analyzing the reports and developing the action plans to increase sales and strengthen week areas. Assisting store customers with locating and retrieving bulk items that are stocked within the store. Running a daily report that shows goals and totals made for each day and briefing management on ideas to increase sales. Correcting and amending sales on invoice tickets to keep an accurate count of store gains and losses. 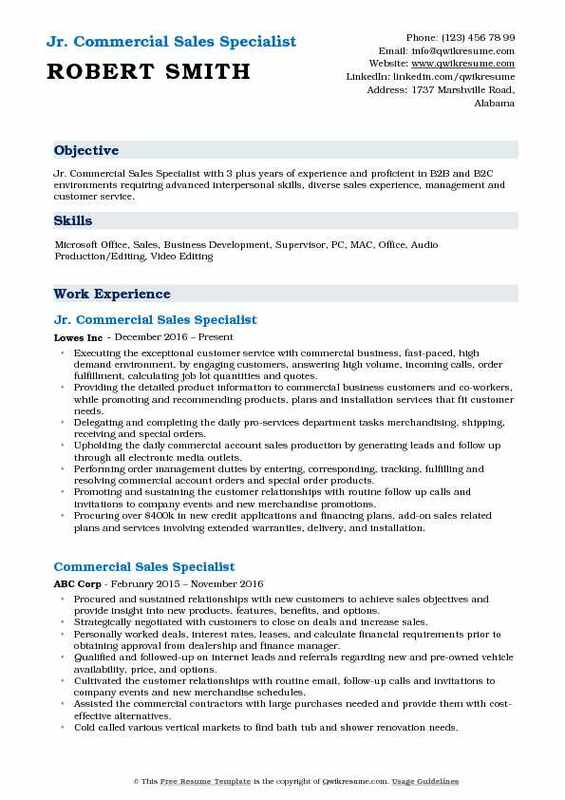 Objective : Jr. Commercial Sales Specialist with 3 plus years of experience and proficient in B2B and B2C environments requiring advanced interpersonal skills, diverse sales experience, management and customer service. Executing the exceptional customer service with commercial business, fast-paced, high demand environment, by engaging customers, answering high volume, incoming calls, order fulfillment, calculating job lot quantities and quotes. Providing the detailed product information to commercial business customers and co-workers, while promoting and recommending products, plans and installation services that fit customer needs. Delegating and completing the daily pro-services department tasks merchandising, shipping, receiving and special orders. Upholding the daily commercial account sales production by generating leads and follow up through all electronic media outlets. Performing order management duties by entering, corresponding, tracking, fulfilling and resolving commercial account orders and special order products. Promoting and sustaining the customer relationships with routine follow up calls and invitations to company events and new merchandise promotions. Procuring over $400k in new credit applications and financing plans, add-on sales related plans and services involving extended warranties, delivery, and installation. Summary : Highly motivated, Commercial Sales Specialist IV with 23 plus years of experience and with proven ability to multi-task and to adapt to any situation. Experienced working effectively under pressure while maintaining a positive and flexible attitude, committed to the idea of working collaboratively to provide clear and concise information. Driven to excellence by putting in the time and effort to achieve goals and objectives through a solid work ethic. Responsible for all merchandising of product in the store. Including setup and tear down of displays. Daily goals of, perfect maintenance and to sell through 100% of in and out product. Reading and maintaining all Plan-O-Grams (POG), for all merchandise and displays. Responsible for planning commercial sales day, for contractors in the area. Developing the business relationships with management, customers, and vendors. Exceeded departmental sales goals by 35% resulting in the 3rd largest departmental increase year over year for the entire southeast region. Communicating with other stores to locate parts for businesses and companies. 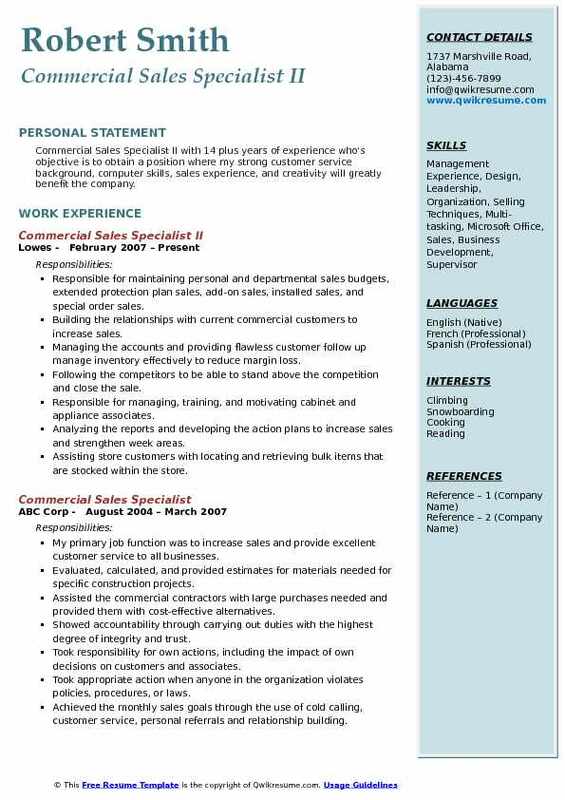 Summary : Commercial Sales Specialist with 27 plus years of experience with successfully managing all aspects of a large distribution center including implanting automated distribution systems; selecting, managing and training staff and constantly a day to day basis greeting customers, and completely giving full customer satisfaction which is my number one goal. I will give world class service and will promote companys name brand. Responsible for assisting customers with all of their shopping needs including assisting customers in the selection, demonstration, preparation, and loading of merchandise. Concentrate on building and strengthening relationships with lowes commercial customers, providing the same level of quality service our in-store customers receive. Achieve commercial sales unit budget goals by expertly servicing existing commercial customers, while actively pursuing and soliciting new accounts. Serving as the store expert in the pro services department by providing detailed product information to customers and peers. Promoting and recommending products, plans, or installation services that match customer needs. Exceeded sales and account growth expectations every month in position. Experience with cold calling, inbound calls, business to business sales, door to door sales, marketing, and general sales. 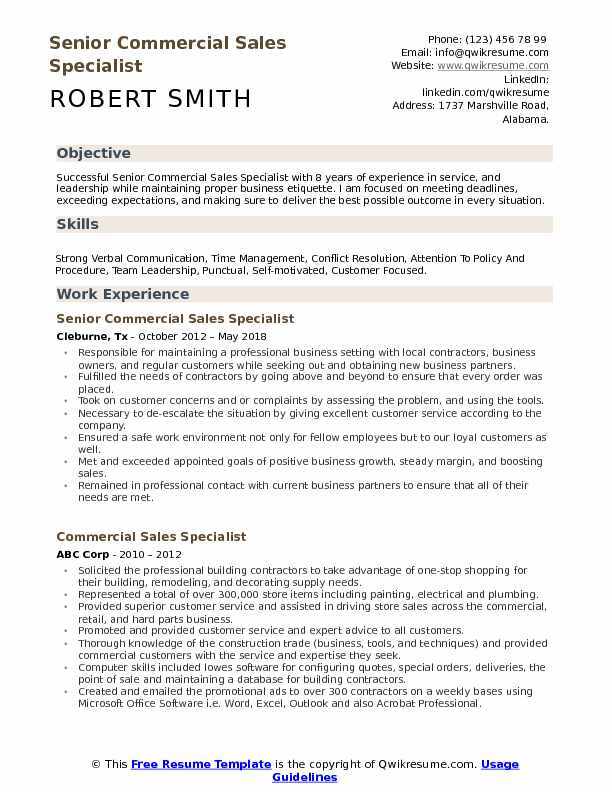 Headline : As a proven Commercial Sales Specialist and leader with over 6 plus years of experience, I am looking to obtain a sales position in your organization utilizing my knowledge of business development. I am highly motivated professional with a strong problem solving ability that will positively affect growth. Taking calls from 30+ accounts and ensure my drivers deliver their parts as speedily as possible. Maintaining a certain gross margin percentage while striving to reach daily and weekly sales goals. Keeping track of account balances for weekly accounts and collecting payments when required. Maintaining the flow of the department while the commercial sales manager is not present. Monitoring the monthly expense reports for the global sales team to ensure company expense policy. Managing and implementing the generation of annual sales goals for the global sales team. Providing customer service for all in-store customers. Creating the blueprints for storage facilities as well as decks. Assiting the customer with the acquisition of necessary licenses. Scheduling the deliveries of purchased items, also scheduling the subcontractor appointments for completion of projects. Summary : Commercial Sales Specialist I with 15 plus years of experience in the Automotives Sales domain is seeking to acquire a position which will allow me to utilize my skills while performing financial and Administrative duties. Supervising 2 delivery drivers, ensuring that parts and products are arriving at businesses and companies timely. Ordering parts for a wide range of automotive shops throughout Maryland. Developing and maintaining a relationship with business, professionals, and contractors to provide them with products for their business needs. Promoting the programs and educating customers on new products that are available to them. Engaging the consumers from the beginning of their project till its completion. Teaming with the management to maintain store inventory that meets the customer needs to be based on market trends and seasonal changes to drive sales storewide. Acquiring a working relationship with outside vendors to find products unique to each customer needs. Top sales specialist in the department meeting monthly budgets month in and month out. Mentoring the new employees on all aspects of the commercial business along with overseeing their ongoing training. Striving to ensure a team atmosphere in the department and throughout the store.